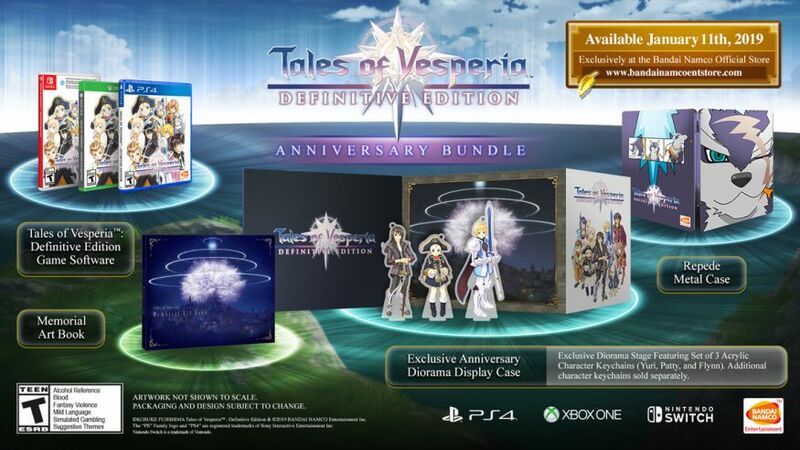 The official Bandai Namco Entertainment store has revealed the Tales of Vesperia: Definitive Edition Anniversary Bundle, exclusive to the online store in North America. Similar to the game, the bundle will launch on January 11, 2019 for Nintendo Switch. The Anniversary Bundle includes a copy of the game, memorial art book, exclusive anniversary diorama display case, and Repede metal case. We’d also like to point out that the American box art has a “download required” banner. This banner isn’t on the European and Southeast Asian packaging… for now.